#104 is non-sports, featuring documentaries, travel shows, etc. Channel 106 is a bit more inclusive with at least half of its programming consisting of live sporting events. Outside of specific channels, DIRECTV broadcasts select NBA, College Football and English Premier Soccer League contests in 4K. Go here for a list of the upcoming matches in 4K. In general, DISH is just slightly behind DIRECTV in the 4K sports arena. They have one channel (#540) dedicated to 4k college football games via Fox Sports, but do expect to add basketball, baseball and NASCAR in the near future. When that happens, they’ll likely be right up there (or ahead) of DIRECTV. One of DISH’s current upsides over DIRECTV is that they offer free HD for life. So, as 4k becomes more predominant, after you pick up a 4K TV, it won’t cost you a running monthly charge to enjoy its insanely high clarity (8.2 million pixels!). Package: with English packages, America’s Top 120 plan or above is required (note the Flex Pack doesn’t qualify you for 4K). Ultra HD isn’t currently available with Spanish-language plans but expect that to change soon. If you’ve already experienced 4K TV resolution (3840 x 2160), you know just how crystal-clear, crisp and non-pixelated the picture quality gets. Essentially, the massive number of extra pixels close the space between pixels found in previous HD technologies, resulting in an amazing viewing experience from any angle or distance to the TV. 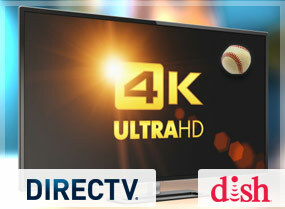 It’s still early in the evolution of 4K and as more sporting events get shot in 4K, you’ll slowly see DIRECTV and DISH expand their options, letting you critique that last-minute TD or blown strike call in the 9th that much easier! This is an ever-growing list, but just a few of its more popular sources include Tastemade, PopSugar, Mashable, Saveur, Newsy, Machinima, Jukin and a ton more. In total, you’ll get access to over 100.000 videos at any given time. And, remember, those are all already publicly available on the internet — the convenience here is the Entertainment Extras App centralizes, categorizes and suggests them according to your preferences (much like the Genie does with recommended shows, movies, etc). Big picture, if its suggestion engine gets smart enough, this app has the potential to become a “home page” of sorts for viral videos. This one’s easy — simply hit the right arrow on your remote and a menu of apps/options will appear. Select “Entertainment Extras” (usually near the top of the list) and you’re all set. As with most functions on Genie’s program guide, it tends to learn your habits over time. So, the more often you select Entertainment Extras, the higher up on the menu it should appear thereafter… just don’t squeeze out the Weather Channel app (else you’re likely to be sporting shorts smack in the middle of a snowstorm :). 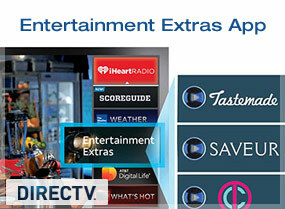 Since it’s a new app, expect DIRECTV to give it a bit more exposure right out of the gate. After a few months (depending on how well it does and how often folks return to it), it may get lost in the mix or eventually earn a coveted top spot; only time – and user engagement – will tell. Finally, you’ve probably figured out the Entertainment Extras App is only available via the Genie (HR44 or newer). Given the programming and light AI involved here, don’t expect it to be available on the non-Genie DVRs anytime soon.